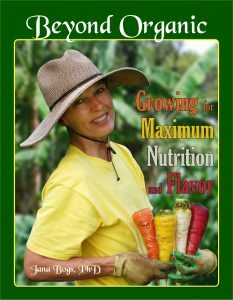 The following are examples of foods grown for increased nutrient content, also known as Nutrition Grown™. 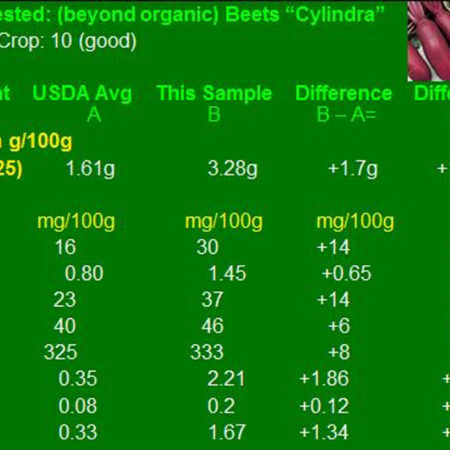 In most of these examples, the “Beyond Organic” Nutrition Grown™ foods are compared to USDA values from the current food nutrient database. (Malus x domestica Borkh. cv Braeburn) apples grown at Royal City, WA, USA under biologically enhanced organic (BEO) methods with nutrient and microbial enhancements were compared with apples produced using conventional methods. Apples from the outer and inner tree canopies were evaluated for antioxidant capacity, soluble solids content (SSC), shelf life, and consumer acceptability by sensory taste panels. Formazan soil tests to estimate microbial activity were correlated with fruit properties. There were no differences (P > 0.05) in 2,2′-azino-bis[3-ethylbenzothiazoline-6-sulfonic acid]/Trolox equivalent antioxidant capacity (ABTS/TEAC) or 1,1-diphenyl-2-picrylhydrazyl radical (DPPH/TEAC) antioxidant capacity between BEO and conventional cv Braeburn apples. However, BEO apples had a higher level (P = 0.003) of total phenolics (TP) assessed by Folin–Ciocalteu reagent than conventional apples, and outer-canopy apples had higher SSC (P = 0.002), as well as higher TP, ABTS, and DPPH antioxidant properties (P < 0.01) compared to inner-canopy apples. BEO apples from both outer and inner canopies also had higher SSC (P < 0.001) than those conventionally grown. There was no difference in shelf life between BEO and conventional apples (P = 0.366), nor between outer-canopy and inner-canopy apples (P = 0.286). The overall acceptability sensory ratings for BEO apples were significantly higher (P < 0.001) than conventional fruits and outside-canopy fruits were rated superior to inner-canopy fruits (P < 0.001). Different cultivation systems of fruit trees may influence fruit nutrient and phytochemical content, and consequently, human responses. This experiment compared two cultivars of apples (Malus domestica Mill.) each under differing cultivation systems. These were evaluated for antioxidant activity, human glycemic response, soluble solids content, shelf life and consumer acceptability by human sensory panels. In addition, soil and leaf tissue tests were performed and correlated to the above results. ‘Braeburn’ (M. domestica ) apples grown in Washington state under biologically-enhanced organic and conventional methods were evaluated in 2007. Treatments were split to include apples from the outside and inside of the tree canopies. There were no differences (P > 0.05) in ABTS or DPPH antioxidant activity between organic and conventional ‘Braeburn’ apples. Organic ‘Braeburn’ apples had a higher level (P = 0.003) of total phenolics (TP) than the conventional apples. Outside-canopy apples had higher TP, ABTS and DPPH antioxidant activity levels (P < 0.01) than inside-canopy apples. Organically-grown ‘Braeburn’ apples from both outside and inside the canopies had higher soluble solids levels (P < 0.001) than those conventionally-grown. Fruit soluble solids content was higher (P = 0.002) in ‘Braeburn’ apples from outside the canopies than from inside the canopies. There was no difference in shelf life between organic and conventional ‘Braeburn’ apples (P = 0.366), nor between outside-canopy and inside-canopy apples (P = 0.286). The ‘Braeburn’ overall acceptability sensory ratings for organic apples were significantly higher (P < 0.001), than conventional fruits, and outside-canopy fruits surpassed inside-canopy fruits (P < 0.001). ‘Crimson Gala’ (M. domestica) apples from Washington state orchards grown under biologically-enhanced conventional management and typical conventional management were evaluated in 2008. The biological apples had higher ABTS antioxidant activity than the conventional (P = 0.0498). The conventional ‘Gala’ apples had higher DPPH antioxidant activity (P = 0.002) than the biological. There was no difference (P = 0.681) between the biological and conventional ‘Gala’ apple total phenolics (TP) levels. None of the values used to compare human glycemic response were statistically different (P > 0.05). The conventionally-grown ‘Gala’ apples had higher soluble solids levels (P = 0.005), greater shelf life (P = 0.035), and a higher overall sensory rating (P = 0.014) than the biologically-grown fruit. 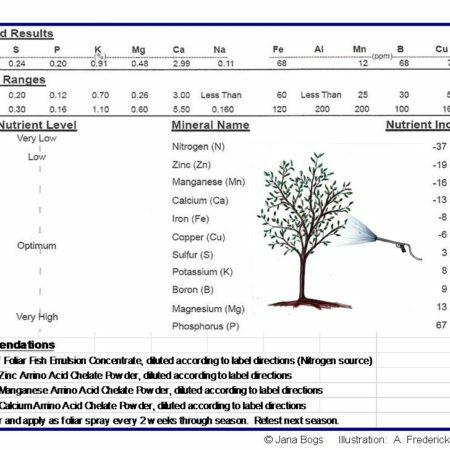 The above measured values were also correlated with soil, leaf, and fruit tissue values. It should be noted that the biological ‘Gala’ orchard had a soil with a cation exchange capacity (CEC) of 7.1 meq/100g compared to the conventional control orchard’s CEC of 11.3 meq/100g, which may have negatively affected the quality of the biological apples. Understanding how cultivation practices affect consumer acceptance will encourage growers to further improve production practices.